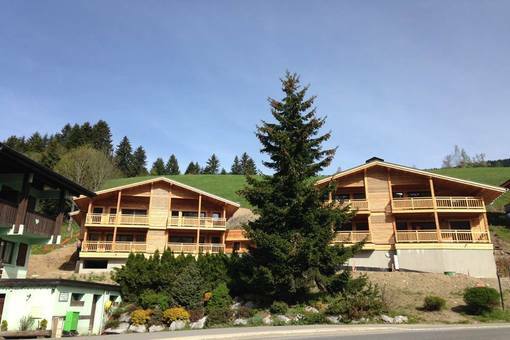 Apartment Adonis, les Gets is a 2nd floor apartment in a newly built complex completed in 2015. 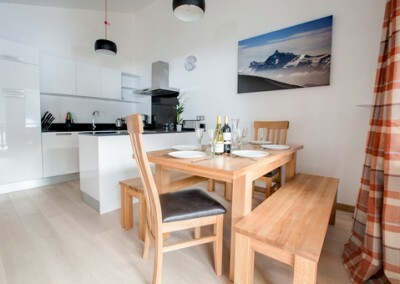 It is ideally located on the edge of Les Gets, opposite the Perrieres 6 man chair lift for speedy access into the heart of the Les Gets ski area. The town centre is a 5 minute bus ride or 15 minute walk, consequently the location couldn’t be better: fast access to slopes, easy to get into town, but nice and quiet away from any late night noise once you’re back. The apartment has 2 bedrooms and can accommodate 5-7 people. 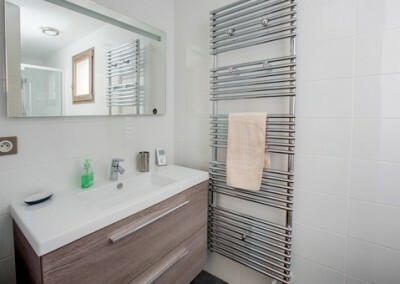 It has been furnished to a very high standard and has underfloor heating throughout. The living area is fully open plan at the front of the building to get the best views. 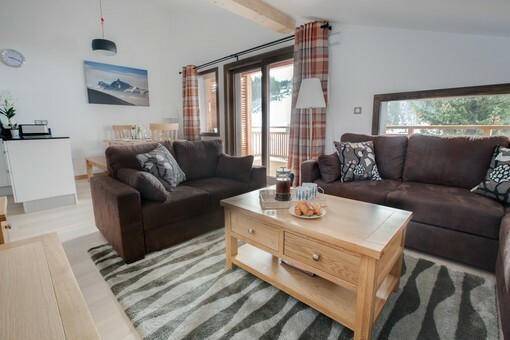 The seating area has 2 large comfy sofas (one of which can be used as a sofabed) that you’ll want to sink into after a long day skiing. 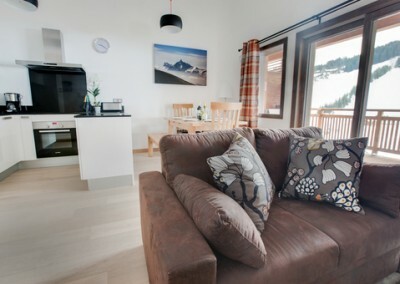 The large French windows open out onto a sunny terrace balcony which overlooks the ski slopes opposite. Therefore you will be able to check out snow conditions while enjoying a steaming mug of tea or coffee in the morning! Additionally there’s all you need for evening entertainment: a TV with english & french channels, a Blu Ray DVD player and selection of DVDs, a docking station and WiFi internet access. For old school entertainment there is also a selection of books and games. 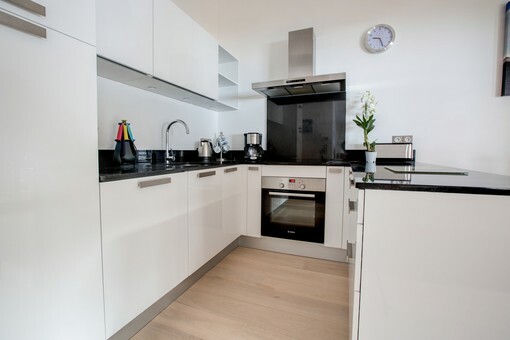 The kitchen has a beautiful modern gloss finish, a stunning real granite worktop and is fully equipped with everything you need, including a coffee machine. On the ground floor of the building, there is garage space for one car with a ski locker and boot warmers so you’ll head out to the ski slopes each day with nice toasty warm feet. Gone are the days of damp, cold ski boots! The apartment has two bedrooms sleeping five people. 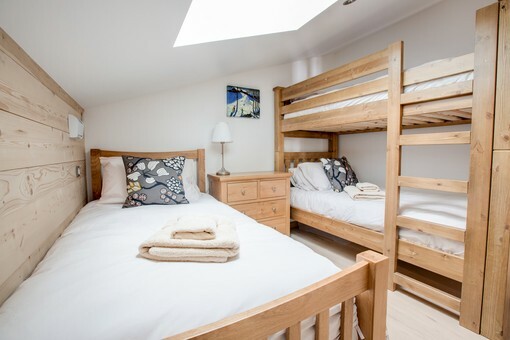 Bedroom 1 has a double bed and bedroom 2 has a bunkbed and a single bed. It is possible to accommodate a further two people by using the sofabed in the lounge. There is a shower room and a separate toilet adjacent to the bedrooms. 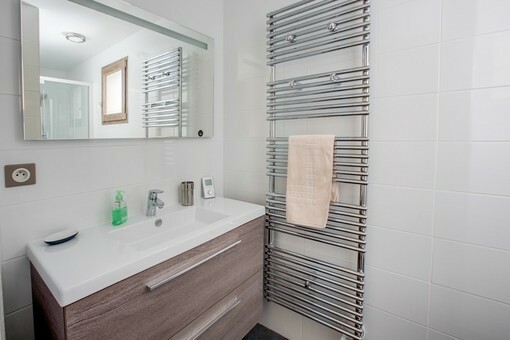 All rooms have ample storage space in the built in wardrobes. Jo will meet and greet you when you arrive and is always on hand to help with any questions you have. 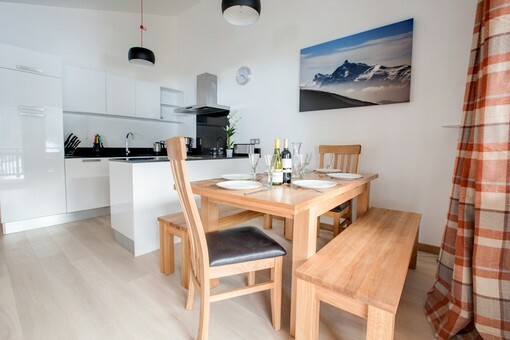 Furthermore the apartment will be spotlessly clean for your arrival, and all beds made up with fluffy duvets, pillows and good quality bed linen. 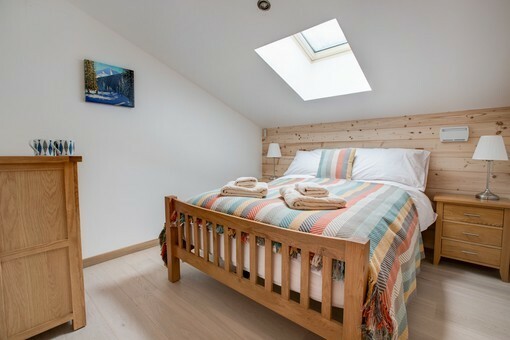 Bedroom with a single bed and full size bunkbeds. There is also plenty of storage space in the built in wardrobes. 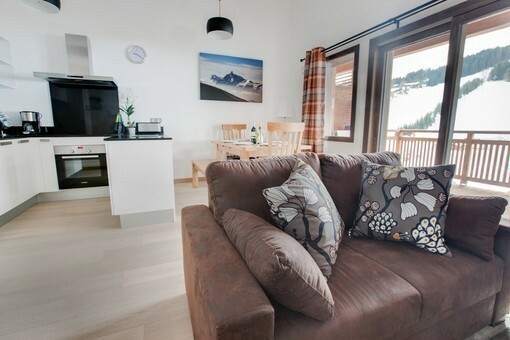 Chalet Adonis, les Gets is in an ideal location for keen skiers, located just opposite the Perrieres chair lift and the ski run of le Mélèzes. For those having lessons on the Chavannes, there is a ski bus that stops close by. The village les Gets is just a 10 minute walk from the chalet also. Brand new appartement with a great view. Only 2 minutes by foot to the Perrieres Chairlift, which takes you into the center of the Les Gets skiarea in only 6 minutes. The kitchen was very well equiped. Big sunny balcony. Skirental on 100 meters, as well a small Sherpa Supermarket. Center of Les Gets can be reached by foot in about 10 minutes. Taxi transfers fom Geneva Airport can be arranged by the manager. Thanks Jo for the taking care of everything. Paul R.
The apartment was great. It’s brand new and nicely appointed. Location is toward the edge of town, but just across the road from one of the high-speed lifts and bus stops for the free buses into town. A 15-minute walk or 5-minute bus ride gets you into the center of town. A small grocery store is just a 5-minute walk away. On top of everything else, Jo was very helpful with information and suggestions, even going out of her way to help us book cars to get back and forth to the train station in Cluses. Michael V.
Please get in touch if you would like more information on any of our proerties or if you would like to make a booking.